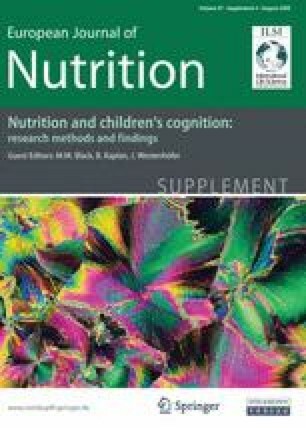 It is widely accepted that the rapid rate of growth of the brain during the last third of gestation and the early postnatal stage makes it vulnerable to an inadequate diet, although brain development continues into adulthood and micronutrient status can influence functioning beyond infancy. A deficiency of various micro-nutrients in developing countries has been found to have long-term implication for cognitive development. Vitamin A plays a critical role in visual perception and a deficiency is the leading cause of childhood blindness. A lack of iodine during a critical period in brain development is associated with reduced intellectual ability. Iron shortage is a widespread problem in the developing world but also in industrialized countries. There is evidence that iron deficiency in early life adversely effects brain development. In addition in industrialized countries a role for folate in the prevention of neural tube defects is well established and in a few individuals impaired cognitive functioning is associated with the inadequate provision of vitamin B12. The controversial suggestions that sub-clinical deficiencies of micronutrients may in industrialized societies influence anti-social behavior and intelligence are also discussed. The authors would like to thank the reviewers Bonnie Kaplan and Joachim Westenhöfer for their useful comments and discussions. This work was commissioned by the Nutrition and Mental Performance Task Force of the European branch of the International Life Sciences Institute (ILSI Europe). Industry members of this task force are Barilla G.&R. Fratelli, Coca-Cola European Union Group, DSM, Groupe Danone, Kraft Foods, Nestlé, Südzucker/BENEO Group, Unilever and Wild Flavors. For further information about ILSI Europe, please call +32-2-771.00.14 or email info@ilsieurope.be. The opinions expressed herein are those of the authors and do not necessarily represent the views of ILSI Europe. Conflict of interests The author has no financial or other interests that might conflict with the views expressed.